During Pentecost celebrations in Arraiolos, Portugal, in May 2018, Master Antonio Paris, in the presence of his Chancellor and Seneschal, sign the Declaration of Arraiolos, effectively resuming the term for which he had been elected in 2004, in order to prepare the free, universal and transparent elections of a new Master and the unity of the Order. After 2007, when Master Antonio Paris suspended his term in office due to personal health problems and professional commitments with his local government, where he has taken a few official leadership positions, the Chancellor Fr+ Luis de Matos organized new elections, according to the Rules of the Order. Please see the article in the Templar Globe about that subject. At the end of the term, no candidates presented candidatures. It was decidade by the Magisterial Council that the Chancellor would also assume the role of Interin Master and prepare the needded background work to call new elections. In the folowing years several Priories left the Order, leaving only two possible candidates for the position and very few voting members. The OSMTHU prides itself of always holding free universal elections audited by independent partners. The Magisterial Council prepared new elections throughout 2016 and 2017, however the strict rules for candidacy (among them the requirement that candidates to the Mastership must have served as elected national Priors) determined that no suitable candidates presented themselves. 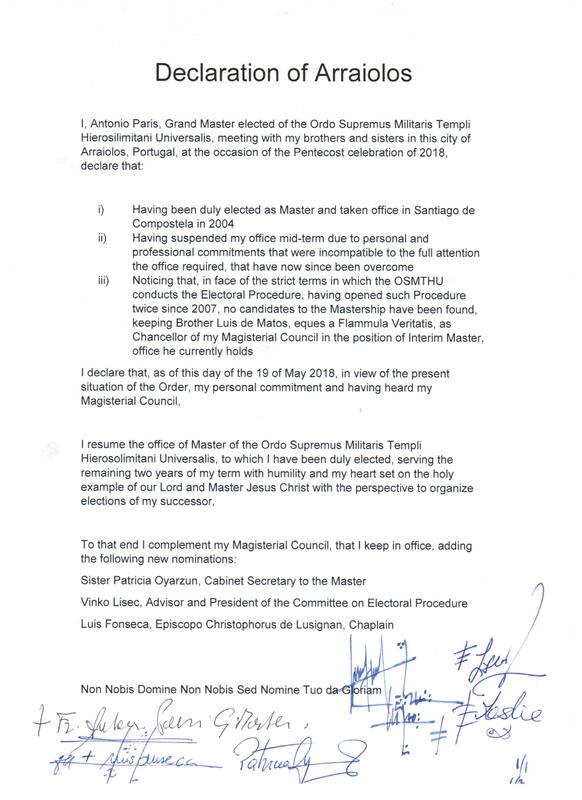 Currently, the Order maintains as Master Fr+ Antonio Paris that will finish his term of election after the Declaration of Arraiolos and Fr+ Luis de Matos, who was Interim Master between 2007 and 2018, returns to his position as Chancellor of the Magisterial Council. Master Emeritus Fernando de Toro-Garland (left in the photo) passed away in June 2017.